23rd March 1997 - 'There's no place like home' chase. Forecast was nothing inspiring at all. Chance of a late thunder shower before a cooler south front. Around 12pm I noticed several very large and well developed cumulus cells over the ocean, at 70 -150 kilometres ( 40 - 100 miles ) out to sea. Not an uncommon sight on early winter mornings after a cool / dry wind from the land. But this was early Autumn and winds were a NE seabreeze. Chase problem No1 with my area, I can only chase in a 180 degree arc, to the east is the Pacific Ocean. To the west and north west over the Illawarra escarpment there was some small cumulus, but these were spreading out to altocumulus before obtaining any significant cell structure. Around 1.30pm my wife wanted to go to the beach for a swim. I volunteered to go with her, but stay dry and watch the cells over the ocean instead. Around 2pm cumulus to the SW ( over land ) started to get a bit more organised and a small storm was very rapidly forming. I judged this to be southwards of Nowra. To the north, there was some cirrus streaked out from anvils I could not see. The shear must have been strong as the cirrus was moving quite rapidly and was long and thin. Meanwhile the storm cell to the south was coming along nicely, not severe in any way, but with healthy cells behind it building rapidly as well. It was then that I decided to chase. The question was where ! I decided that I would review the situation once I had taken my wife home and she had showered ( all that salt and sand ), she wanted to go as well and I thought fair enough she can drive and I will look and perhaps get a photo. In the short time it took to get home, get the camera, etc, another cell had built rapidly directly to the west, this was a dilemma, do I head north, up Mt Ousley pass, then westwards to Picton. This route would take me to the NW of the activity. Or do I risk the drive south to the earlier cell. I decided on a southwards journey. It was now after 3pm. At Kiama the action to the west had intensified, but hard to see structure through the rain falling from the storm. Chase Problem number 2 with chasing from the coast here, is you are always starting from the wrong side of the anvil. I decided that I would make a decision at the Mt Pleasant lookout, south of Kiama, as to whether to keep heading south, or head back up Jamberoo Pass. At this point I will introduce Chase problem number 3 with chasing from my area. The Illawarra is a narrow coastal plain, backed by an escarpment, that varies from ( 300 -750m ) 1000--2500ft. There is only a few roads out of the coastal strip and up onto the tableland. Some like Jamberoo and Macquarie Pass are 10-15 kilometres ( 7-10 miles ) of narrow winding road that delay you and limit all visibility to the sky. At the Mt Pleasant lookout my worst fears were realised, the rather nice cell I was hoping to chase was already heading seaward over Jervis Bay, still some 40 mins away. At the rate these storms were moving it would be well offshore by the time I got there. I did a U turn and headed west to Jamberoo and the notorious pass. Light rain started to fall at Jamberoo and there were a few loud booms of thunder. Half way up the pass low cloud from the moist NE wind set in and proceeded to get thicker, this lasted for the 15 mins along the top of the escarpment. At Robertson the low cloud disappeared completely. The scene westwards was not overly joyful, lots of cumulus, but the best cells were to the east, over the coast, just from where I had come. I decided to still press westwards, then north to Bowral. At Bowral around 4pm, whilst my wife had an ice cream, I surveyed the storm situation. To the west was a small but promising cell, to the north, nothing, but given the rapid movement of the storms today that meant nothing. To the east was some very nice cells, which I took photo's of. All the storms I had seen today had really shot up once they passed over the coast, not the usual script. The penny dropped, I should have taken more notice of the cells over the ocean earlier in the day. I decided then to drive back SW towards Moss Vale, which should take me close to the western cell, but at the same time take me to the Illawarra and the road home. From Moss Vale I could then have it chase me eastwards towards home. At Moss Vale heavy rain started. But the change in my road direction to eastwards soon took me out of that. The west cell moved to the south of me and developed very rapidly into a very nice storm, the best so far today. Meanwhile development had rapidly occurred to the NW as well. At Robertson again and the low cloud set in once more, visibility in the fog on the top of the escarpment was that bad that we had to crawl along at about 30 kph ( 20 mph ). Down the infamous Macquarie pass and poor visibility from fog, then sub tropical rainforest cover for the next 13 kms ( 10 miles ). At the base of the pass around 5.00 - 5.30pm I was surprised when about the first thing I saw was a nice cloud ground strike off to the NE. This looked very promising. As I hit the Shellharbour suburbs at Albion Park I saw that the best development was occurring right overhead. A roll cloud was rapidly moving away southwards from the heavy rain and downdraft of this storm. Cloud ground lightning was particularly common. 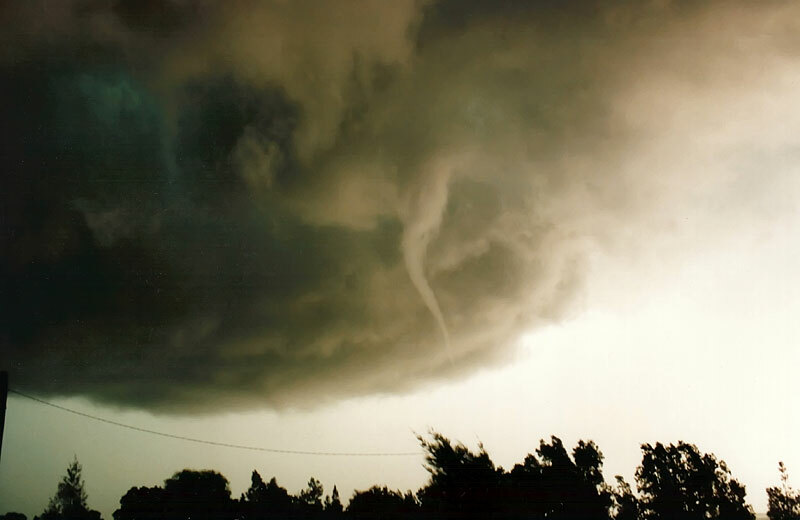 Part of the roll cloud even twisted into a funnel shape, but it was not a true funnel, just turbulence. I got home again with torrential rain falling and dropped the wife off. The scene to the SW was spectacular, almost non-stop lightning and that dark green colour that means hail. The rain stopped about 5 mins after reaching home. I was on the north edge of this now particularly severe storm. 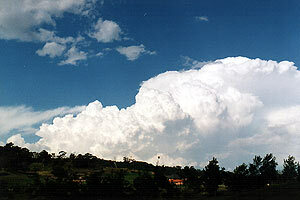 The weather bureau had a severe storm warning out for the area. I decided to hit the road again, it was now around 6.00pm just to get a better view to the west and south west ( which is blocked by a hill ). I took the road which winds around the south shore of Lake Illawarra, this gives a good view to the west across the lake. The view was great, to the SW was a torrential hail/rain curtain, to the west was an ink black updraft area and a developing wall cloud. Time to pull over and get the camera. What !! no camera, I could not believe it, my wife who normally leaves everything in the car, and I mean everything, had actually decided to remove my camera. I was only 5 mins from home, so I hit the road and headed back for it. I raced in the house, cursed my wife and grabbed the camera, she did not want to miss the action and jumped into the car as well. I headed around the lake again, when I saw the wall cloud next it really had moved closer, and it was rotating. I pulled over and a took some photo's. Part of the wall cloud really accelerated its rotation and a small funnel formed. I took more photo's, the funnel was very small, but the rotation area it came from was large and severe looking. The funnel lasted 2 mins maximum before roping out in an almost classic way, albeit on a small scale, of course I was changing film at the rope out stage. Even worse was to come, in my nervous excitement I had started firing shots without thinking of exposure settings, etc. By the time the new film was in the camera, heavy rain had started. The wall cloud was completely obscured within seconds. I headed back home. Later I took some photo's of the storm after it had moved out over the ocean. It was only a VERY small funnel, but it was not a toy, it came out of very fast rotating section of wall cloud, on the NW corner of a severe storm. As far as saw it never touched ground. I have seen on US videos far more impressive tornadoes, from less impressive rotating wall clouds. 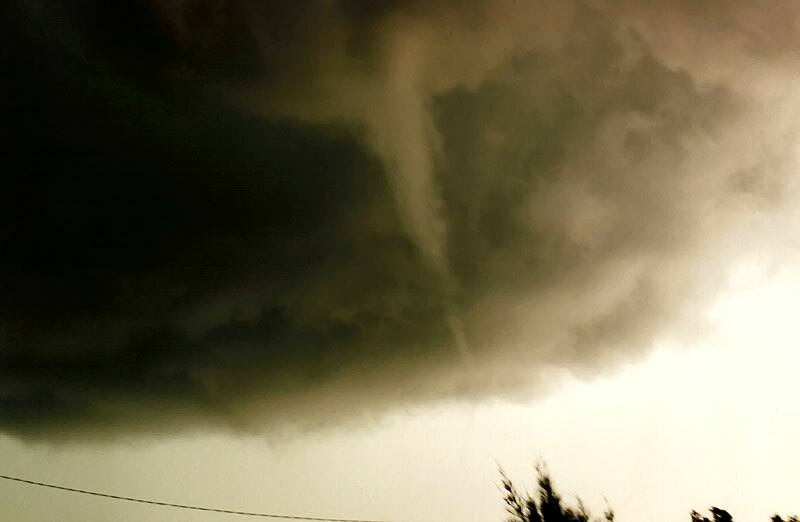 Had it matured into a full tornado it would have been over an urban area. I asked work mates the next day about the action in their area. Several reports of hail, power lines down at Berkeley and flash flooding. I received 32mm ( 1.5in ) in less than 20 mins, and I was on the northern edge. The storm moved rapidly over the ocean and as darkness fell put on a light show. The lesson I learnt from this chase was to pay attention to the cells over the ocean. Under ordinary situations with afternoon thunderstorms there is nothing over the ocean, until the cells move offshore. The reports that night on TV did not give any explanation, there appeared to be a weak stalled cold front, but also a small cell of low pressure forming off the coast. This happens occasionally with cold air in the upper atmosphere moving over the warm Pacific.